Thanks to the wonders of modern technology, I have been out of the office for the past few days but I am able to keep doing blog posts by “front-loading” them. I am back in today, so let me give you a quick update of where I have been and what I have been doing. Yep, another turkey down. Actually we spent an extended weekend in North Platte with family. My nephew got married last Saturday, so we had lots of “family doings” in association with that. Congratulations Tadd and Tiffany! Sunday afternoon my son Daniel and I were able to slip out and work on his spring turkey tag. It was windy as all get out, but we found turkeys right away. These birds were all flocked up yet; there were at least a dozen hens, 3 or 4 big Toms and a jake or two. We spent the afternoon and evening trying to position in front of them as they fed and coax one of those big Toms into shotgun range. At one point we had two big Toms peel off and come marching right at us, but they got to about 80 yards and stopped, would not come any closer. We did not have time to slip a hen decoy out and I wonder if that might have encouraged them to come the rest of the way. We watched the birds go to roost Sunday evening and then had some time to slip out again Monday morning. Now I will tell you that first thing in the morning, sunrise, is in my opinion the most over-rated time of day to hunt turkeys in the spring. If I had a dollar for every time I put birds to roost and thought I would get one first thing the next morning, I could probably buy a new shotgun. The Toms are usually with hens right away off the roost and the hens may take them in the exact direction opposite of you and your calling. But, we had time to hunt Monday morning and we had an idea of where we thought they would go after they assembled and started moving out to feed. It was windy as could be again Monday morning; we were within a couple hundred yards of the birds but could barely hear them. I called to a few hens but never heard a gobble until they were heading up the hill towards us. I managed to get the Toms to gobble a couple of times as they came, but I think we were just in the right spot as much as anything. If you want to call a turkey, it really, really helps if you are in a location where they want to go in the first place. As my gramps would say we had “Mr. Dam, Mrs. Dam and the whole Dam family” work right to us; the whole flock. That is such a rush to sit so close to so many turkeys and observe them without them even knowing you are there. They did not know until Daniel made his move and dumped the dominant Tom at 24 paces. 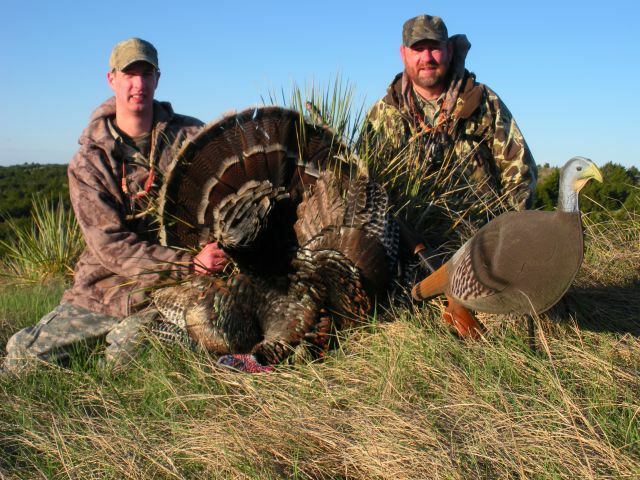 His bird was a 2-year old; 3/4-inch spurs, a beard just a little over 8.5 inches and 17 pounds. We have killed bigger, but as I told him I would never hesitate to get the bird he got, would do it again, in a heart-beat! Just down the slope behind Daniel is where we got his bird. 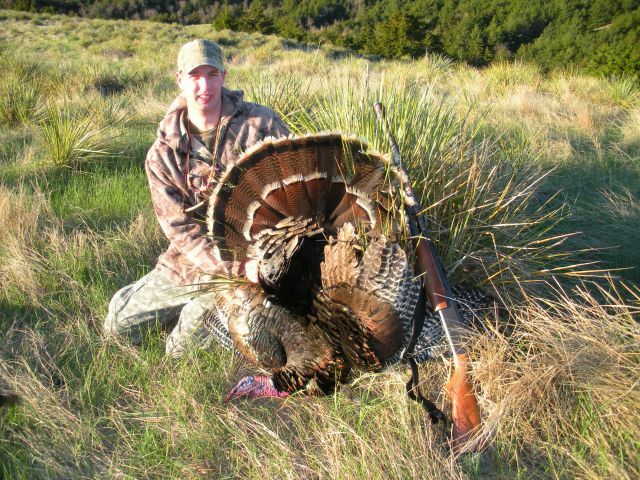 I love hunting the canyon country south and east of North Platte. Back in the day when I was growing up in the area, I never dreamed we would be hunting turkeys there one day! I wanted to have a picture of a rattlesnake to post here . . .
Yep, we found a rattlesnake while we were hunting. I always say I know I am in good country when I find a rattlesnake. We were in the middle of the hunt, repositioning on birds, cruising along just below the ridge line when Daniel walked right by the snake and turned around to point it out to me before I ran into it. 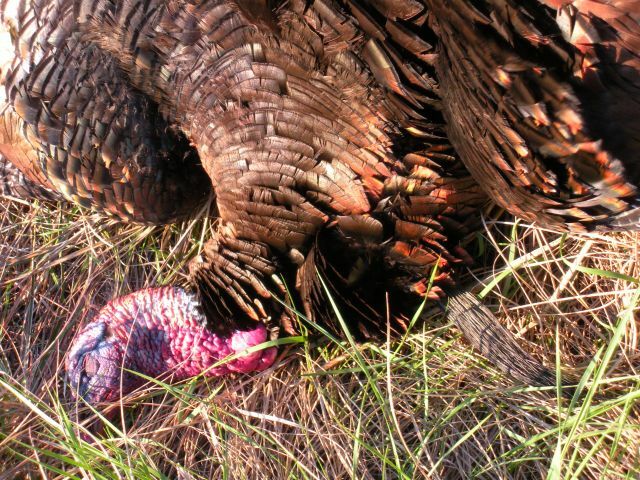 Anybody care to go turkey hunting with me? This is not the first time we have found rattlers during spring turkey season. Actually this snake was already dead. My mom wondered if it had come out of the den too soon and died of the cold weather. Ha. Actually it’s head had been pummeled but I have no idea what might have killed it. Since we were in the middle of the hunt we did not stay to look at it closer. After Daniel harvested his bird we went back looking for it; it was in an area of very short, almost no grass, and we knew approximately where it was, but we looked and looked and could not find it again. I believe sometime between Sunday afternoon and Monday morning something had a nice rattlesnake dinner. The weather was not very nice for us over the weekend; we did not even think of fishing. But I will tell you what I have been hearing and give you an idea of something you should take advantage of right now. The white bass are starting to make their spawning “run”. If you have access to a Nebraska reservoir with white bass look for those fish moving up tributaries and feeder streams right now! Need some ideas where to go? Start here, http://www.ngpc.state.ne.us/fishing/pdfs/FishForecast.pdf . Again let me say that fishing for any species while they are actively spawning can be tough because those fish have other things on their minds. But, once again white bass congregate during their spawning behavior and with a concentration of fish if you can just get a few to bite you can still catch a bunch. In addition, most white bass spawning activity will actually take place after dark and during the day those fish can be caught, especially the males. Fishing for white bass is usually relatively easy, try tossing 1/8 oz. jigs, maybe some small spinners, spoons or crankbaits, and if the fish are not in a positive feeding mood try some live minnows. 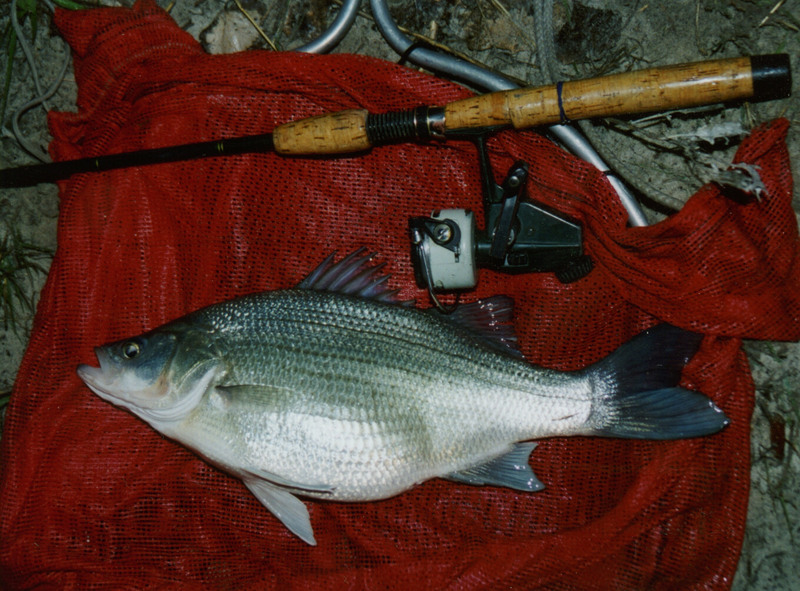 If you have access to canals, tributaries, rivers or feeder streams look for the white bass there right now. White bass will also spawn on wind-swept shorelines in the main body of a reservoir, but that activity probably will not pick up for a couple of weeks yet. I have lots of other blog posts on spring turkeys, fishing and a variety of other topics floating around in my head, but that is all for now. Stay tuned, more spring to come! Enjoy reading your blogs Mr.B, and I might have to check out the white bass thing. Have family in Hershey, kill 2 birds…. My nephew has been catching white bass on the canal. They are there now.